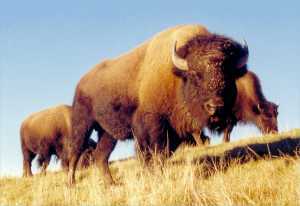 The American Bison once roamed the plains of North America in vast herds which numbered at least sixty million at the beginning of the nineteenth century. 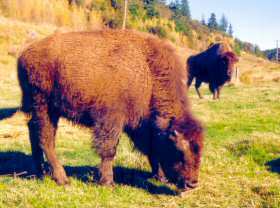 By the beginning of the twentieth they were almost extinct as a result of wholesale slaughter by European settlers who hunted them indiscriminately for their hides and flesh. Numbers have now increased markedly as the result of conservation measures, although they are still protected in America. Less than a hundred can be found in New Zealand – original breeding stock being imported from farm parks and zoos. It is hoped to farm them for their meat which is leaner than beef.